The year 2017 was celebrated worldwide as a “Telemann Year”, seeing 250 years of the composer's passing. With the project Telemandolin Alon Sariel and his ensemble Concerto Foscari pay a unique tribute to the German composer, released by the German label Berlin Classics on Friday June 23rd, 2017. Georg Philipp Telemann (14.03.1681 - 25.06.1767) was one of the most prolific composers in music history, his oeuvre comprises more than 3.000 pieces, including all existing genres of his time. A multi instrumentalist himself, he is known to have played the flute, oboe, chalumeau, viola da gamba, double bass and bass trombone. Has Telemann come across a mandolin? Are his set of mandolin fantasias still waiting to be found, like the one recently discovered for viola da gamba and demonstrated here on the lute? Unlike some of his colleagues such as G. F. Händel and J. A. Hasse, who included the mandolin in some of their works, Telemann has most likely never heard the sound of the sweet southern plucked instrument in his lifetime, as he barely left today's Germany in all his years. 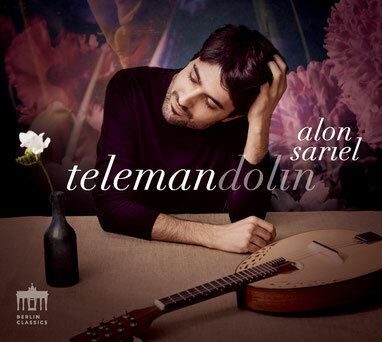 From there did the journey into Alon Sariel's fantasy world begin: Telemandolin! For this project Alon chose some of Telemann's best compositions showing his mastery in different styles and adapted them to his instruments. An Italian concerto, a French suite, a chamber partita and a solo fantasia. To perfect the recording, Alon Sariel used music by two great admirers of Telemann, the lute concerto in D minor by Johann Friedrich Fasch and a gallant sonata by Carl Philipp Emanuel Bach.